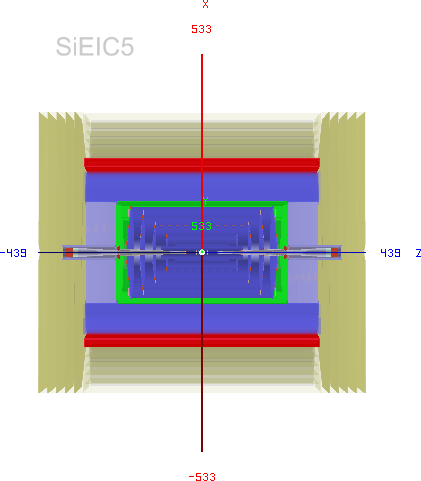 The compact format for the Silicon Detector for EIC. Based on as SiD LOI 090204. Solenoid field is 2.5 T (with return -0.3). HCAL is reduced to 30 layers (compared to 40/45 for SiD). This corresponds to 2.7 lambda. The ECAL has 20 and 5 Scint./W layers (compared to 20 and 10). Muon detector has 7 layers (instead of 11). Solenoid thickness is reduced by 70% compared to 5T of the SiD. The HCAL, solenoid and muon detector moved by 450mm closer to the tracker. End-cap regions moved closer to the center. The tracker stays the same as for the SiD detector (but with 2.5 T field). The min number of hits per track is 5 (compared to 7 for the original SiD). The number of ECAL layers is 25 (compared to 15 in the previous version). David: Added symmetricTrackingExtension parameter to stretch all tracking components in the z direction. Calorimeters are enlarged to make room, and the beam pipes are extended. More attention should be paid in the future to the beam pipe configuration and the LumiCal/BeamCal.